Super productive factories of the future could employ fleets of genetically engineered bacterial cells, such as common E. coli, to produce valuable chemical commodities in an environmentally friendly way. 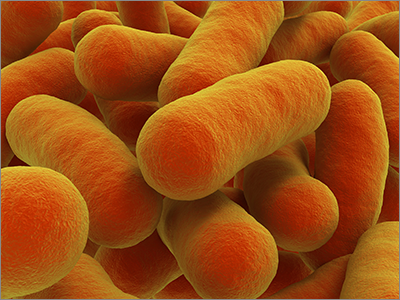 By leveraging their natural metabolic processes, bacteria could be re-programmed to convert readily available sources of natural energy into pharmaceuticals, plastics and fuel products. “The basic idea is that we want to accelerate evolution to make awesome amounts of valuable chemicals,” said Wyss Core Faculty member George Church, Ph.D., who is a pioneer in the converging fields of synthetic biology, metabolic engineering, and genetics. Church is the Robert Winthrop Professor of Genetics at Harvard Medical School and Professor of Health Sciences and Technology at Harvard and MIT. Critical to this process of metabolically engineering microbes is the use of biosensors. Made of a biological component — such as a fluorescent protein — and a ‘detector’ that responds to the presence of a specific chemical, biosensors act as the switches and levers that turn programmed functions on and off inside the engineered cells. They also can be used to detect which microbial ‘workers’ are producing the most voluminous amounts of a desired chemical. In this way, they can be thought of as the medium for two-way communication between humans and cells. But so far, scientists have only had access to a limited variety of biosensors that have little relevance to the bio-manufacturing of valuable chemicals. Now, Wyss Institute researchers led by Church have developed a new suite of such sensors, reported in Nucleic Acids Research journal, that not only increase the number of cellular “switches and levers” that scientists can use for complex genetic re-programming, but also respond to valuable products such as renewable plastics or costly pharmaceuticals and give microbes a voice to report on their own efficiency in making these products. The Wyss team aims to leverage the new biosensors to aid in its efforts to develop renewable chemical production strategies using genetically engineered microbes. Linked to green fluorescent protein (GFP), the biosensors can be used to trigger individual cells to give off visible fluorescence in a rate directly proportional to how well they are able to produce a desired chemical commodity. Using the new biosensors, the most efficient microbial workers are easily identified so that they can serve as the predecessors for colonies of engineered bacteria that evolve to become more efficient at producing renewable chemicals with each subsequent generation. This drastically reduces the bottleneck of the design-build-test cycle, which has historically been caused by engineers having to sift through teeming bacteria colonies to find top producers. The findings could also lead to new applications in environmental monitoring using genetically engineered microbes to issue warning signals in the presence of pollutants or toxins, and could unlock new fundamental insights into metabolic pathways. “With this work, George and his team are bringing us closer to a sustainable future in which we would rely on bio-manufacturing for the clean production of chemical and pharmaceutical commodities,” said Wyss Institute Founding Director Donald E. Ingber, M.D., Ph.D., who is also the Judah Folkman Professor of Vascular Biology at Harvard Medical School and Boston Children’s Hospital, and Professor of Bioengineering at the Harvard John A. Paulson School of Engineering and Applied Sciences.